“Bahay Kubo” was just an ordinary folk song until Typhoon Haiyan came and brought the song to life. In November 2013 Typhoon Haiyan, locally known as Yolanda, struck the Philippines. One of the most powerful storms to ever make landfall, it took thousands of lives, and destroyed homes and families’ livelihoods. Over the past two years, communities have been working hard to rebuild their lives after the disaster. Typhoon Haiyan survivor Evelyn Duplito of Barangay Bato Biasong in Ajuy admitted that life was already difficult even before the typhoon devastated parts of Iloilo province. Lack of food due to poverty was among her family’s day-to-day problems, which worsened when Haiyan destroyed her home and livelihood. Never did she imagine that the typhoon would be the start of a better life. And that it would start with the song “Bahay Kubo”, a Filipino children’s folk song. The folk song, often taught to school children, describes a small traditional hut, with many vegetables growing around it (see song lyrics below). 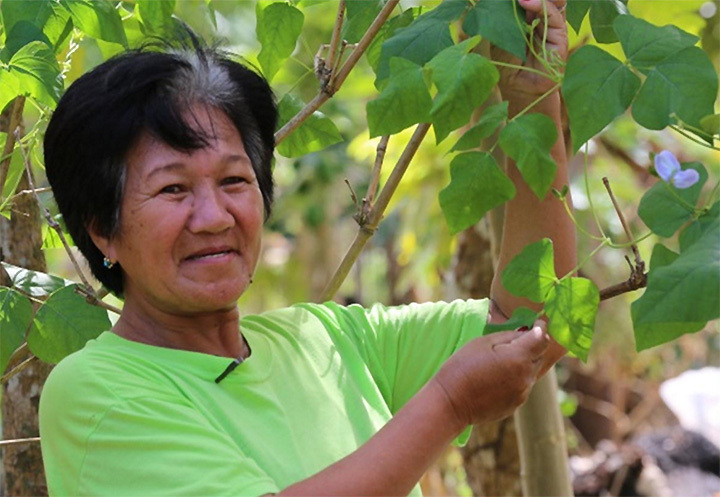 Duplito, whose family was among those chosen to receive a new shelter from the Jaro Archdiocesan Social Action Center, was tasked to plant at least 17 vegetables mentioned in the song “Bahay Kubo” in her own backyard. “At first, I couldn’t understand why we had to plant all those vegetables, especially that not all of us have that much space. But when vegetables started to grow, it became clear to us. Those vegetables became our lifesaver during difficult times,” the 56-year old housewife said. Duplito also drew inspiration from the very persistent community organizers of the social action center. She said that if not for their constant guidance especially when confronted by problems such as lack of space and soil, she and her family wouldn’t be reaping the rewards right at their own table. “We learned that if there’s a will, there’s certainly a way. If we don’t have enough space at our backyard, we can plant vegetables in containers,” Duplito explained. Now, Duplito said that she and her family would just harvest vegetables from their garden as part of their daily meal. She also initiated to plant other crops including fruits that were not necessarily mentioned in the song. She even shared some seeds with her neighbours, who also started to grow their own fruit and vegetable gardens. “Planting at our own backyard does not only save us money, it is also healthy for the whole family,” she exclaims happily. Some say the worst scenario is the ultimate test of a person’s strength which can either lead in two things: destroy you or bring out the best in you. In this case, Typhoon Haiyan was the ultimate test that brought out the best in typhoon survivors like Evelyn Duplito. For she did not only receive a new and improved home, the typhoon also enabled her to stand on her own and secure food for her family. And all around are sesame seeds.